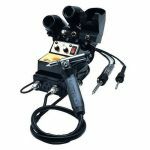 The EDSYN ZD906 is the ideal rework center for technicians using a variety of soldering applications, including hot air, hot tip, and desoldering – get it all with a single station! ESD-safe system includes three different hand tools in one compact package to save you space and time. Powerful heating elements deliver high performance and are well suited for thick heat sinks and multi-layer boards. Choose an EDSYN ZD906 Rework Station Today.